Chicago, IL -- Top Chicago Bluegrass outfit Henhouse Prowlers are partnering with the Greater Chicago Food Depository to present The Bluegrass Pitch-In at Mayne Stage on Friday, Nov. 25 at 8 PM CST. 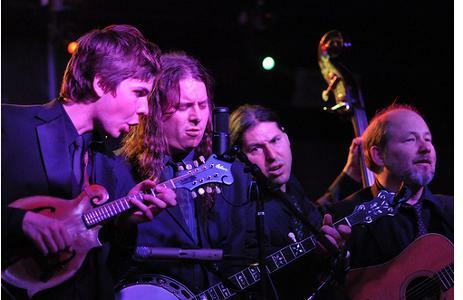 After seven years of hard work and a relentless touring schedule, the Henhouse Prowlers have gained a reputation for their highly original, yet traditional bluegrass, built around intricate harmonies and electrifying on-stage energy. In 2010, while balancing time on the road and in the studio in Colorado, the Prowlers placed third in the prestigious Telluride Bluegrass Festival Band Competition and took top honors in the RockyGrass Band Competition. On November 25, HHP will mark Black Friday with an evening of real roots music to benefit the nonprofit Greater Chicago Food Depository. GCFD representatives will be on hand at Mayne Stage to take donations and provide information about how music fans can address the root causes of hunger and poverty in Cook County. Folk singer Chicago Farmer will be direct support for the Henhouse Prowlers, who will be following their headlining set with an intimate performance at the venue's adjacent bar. Advance tickets are available for $12 and day-of-show tickets are priced at $18. Mayne Stage is located at 1328 W. Morse Ave in Chicago's Rogers Park neighborhood. Doors are set for 6:30 PM on Friday, Nov. 25 and the show is open to all ages.